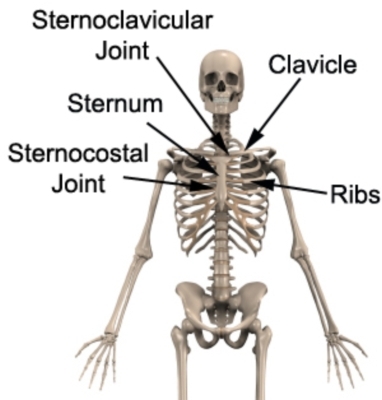 The sternoclavicular joins the collarbone to the sternum and upper body, and is the one bone connecting the shoulders and arms to the rest of the skeleton. It is a synovial joint, gaining the majority of its strength from surrounding ligaments, and due to the uninhibited movement it provides and the small part of the joint which actually connects, it can become relatively unstable if subjected to blunt trauma. Injury to the joint will affect the joint itself and an arm or both arms, especially the shoulders, causing pain in these areas. This pain will be present if the joint is only mildly sprained, but is considerably sharper and instantly recognisable if the sternoclavicular joint has been dislocated. In this case the pain is worsened when moving the arms. There are two types of this dislocation: anterior and posterior. Anterior dislocations cause the collarbone to poke out of position, creating a readily discernible bump on the chest. Posterior dislocations can affect the throat, limiting your ability to breathe or swallow properly; sometimes you may feel as if you are choking. If an injury strikes a nearby ligament then popping or clicking may be felt in the area, in addition to pain and limited sternoclavicular motion. Another way to spot many of these injuries is in the way they may alter your physicality: for instance you may begin to stand with one shoulder further forward than the other. Approximately one fifth of all sternoclavicular injuries are sustained due to a sporting activity, and many can occur as the result of a falling accident. A hard strike to the shoulder is the main cause, pushing the shoulder excessively inwards which damages the sternoclavicular joint (known as indirect force because it does not hit the joint directly). Such injuries can arise from collisions with other players in contact sports (e.g. rugby), or due to falling onto the shoulder in a sport like cycling or horse riding. The other primary cause is a car accident. For dislocations it will be the clavicle itself that bears the brunt of the force, moving the collarbone either in front or behind the sternum (anterior or posterior). Posterior dislocations are more dangerous due to the way they can inhibit or damage important structures like the esophagus or the trachea. Thus in the event of a posterior dislocation it is vital to seek immediate medical attention.